Trans fats are bad and harmful to your body in a variety of ways, including your blood and how they prevent your cells from doing their job. By contrast, more healthful “good fats” come from a variety of foods such as extra-virgin cold-pressed olive oil, organic coconut oil and even grass-fed butter such as the brand KerryGold. (Grass fed produces more omega-3 fatty acids, while even organic factory farmed dairy is unbalanced toward the omega-6 fatty acids). When you eat anything containing these thicker, denser, artificially created trans fats, your blood also becomes thicker and more viscous. Consuming trans fats or hydrogenated oils contributes to high blood pressure when the heart has to work so much harder to pump blood throughout the system. Thicker, gummy blood, can lodge in the arteries and build up arterial plaque. It’s this arterial plaque that probably contributes to high cholesterol. The plaque actually scars the internal walls of the arteries (possibly due to nickel used in the hydrogenation process). One of the functions of cholesterol is to rebuild the body’s cells, so this scarring causes the liver to produce cholesterol to heal the walls of the arteries. The cholesterol is made from this fake “plastic fat” material, which it has to use to heal the scarring. The plaque continues to build up on the arterial walls, slowly shrinking the opening for blood to flow through. The heart has to work even harder to pump the gooey blood through the plaque-filled arteries, placing a great strain on the heart. This thicker blood has a harder time pumping through the arteries and up to the brain. Hydrogenated oils can slow the circulation of blood through the brain, resulting in ailments such an Alzheimer’s, Parkinson’s, ADHD and “foggy” thinking. Could it be that what we consider many of the symptoms of the “normal aging process” is really the result of a lifetime of eating plastic food in the form of trans fats? Aluminum is one of the metals sometimes used as a catalyst of hydrogenation, and aluminum has been linked to the onset of Alzheimer’s disease in a number of studies. 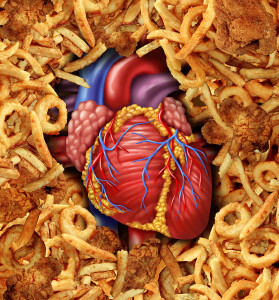 Evidence also suggests trans fatty acids may bio-accumulate in the body. A diet high in trans fats results in weight gain and a myriad of other health problems. All of the brain, nervous system, liver and every cell membrane are made from fat. To function properly, we must consume good quality fat. Cells have both a physical and electromagnetic component. The cell membrane, or wall, is the BRAIN of the cell. It stores voltage for the cell to use and controls the functions of the cell by interacting with the environment around the cell. “Healing Is Voltage – The Handbook” by Jerry Tennant, MD, MD(H), MD(P) provides the best explanation we have read how the body repairs and replaces itself, and how trans fats prevent the cells from properly functioning. “Healing Is Voltage” is a must-read for every health conscious consumer. When cells need to repair themselves, the voltage required increases from the normal -25 millivolts to -50 millivolts. However, this increase to -50 millivolts cannot be achieved without the proper nutrients to create strong building blocks. This is why sometimes diseases persist and wounds do not heal quickly. The cell wall can’t store enough voltage to provide the cell for healing functions. This electromagnetic field helps the cell to identify viruses, bacteria and pathogens, many of which have a positive ionic charge. Healthy nutrients and bacteria have a negative ionic charge. Positive ions cause oxidation of the cells and are typically known as “oxidants” or “free radicals” — any atom or molecule that has a single unpaired electron in an outer shell, which will attempt to steal an electron from other ions, atoms or molecules. Nutrients with a negative ionic charge are also known by the common name “anti-oxidants,” and they serve to inhibit oxidation reactions by the free-radical electron stealers. Normally, the cell would allow materials with negative charges to pass through while repelling those with positive charges. However, when the physical and electromagnetic functions of the cell wall now compromised due to the presence of hydrogenated oils, the cell is no longer able to identify friendly nutrients from foreign invaders. Cells replace themselves frequently. Cell walls are normally made up of healthy phospholipids such as Omega-3 and Omega-6 fats (also known as essential fatty acids or EFAs). The walls of your cells are the cells’ defense mechanism, allowing nutrients and waste matter to pass in and out while keeping foreign invaders and pathogens out. If you don’t give the cell quality building materials, including good fat, it will have to use whatever material is available. Without sufficient good fatty acids, the cells are now forced to use this destructive hydrogenated oil into its cellular matrix. This new cell wall made from hydrogenated oils is virtually useless and this compromises the very function of the cell wall. The plastic fat prevents them from working correctly. The hydrogenated oils in the cell walls prevents nutrients from entering the cell, prevents waste material getting out, but allows pathogens, microbes and viruses to pass through. Now the cell might mutate or die, which may lead to cancer or other serious health issues. If your cell is wrapped in cellophane, the cell can send out signals that it is hungry and the body can send glucose and insulin to the cell, but they can’t get through the plastic membrane. The cell keeps sending hunger signals, and the body continues to send insulin and glucose that can’t get through to replenish the cell, creating insulin resistance and Type II diabetes. Cell membrane becomes saturated with insulin and glucose it cannot use and begins to off-load it into fat cells. This is one way that eating plastic fats cause people to get fatter and fatter. Imagine the same scenario if your brain and liver are wrapped in cellophane. No wonder we have a nation of people who are depressed, fatigued, fidgeting with ADHD, and a liver that cannot filter toxins thereby causing things like fibromyalgia, chronic infections and immune system breakdown. Trans Fat Part 3 – What Are Trans Fats?